I stumbled into this place about ten years ago, but felt like I was wandering alone most of those years. I knew people were making digital art, but I didn't know how to connect with them. A few weeks ago I discovered Sebastian Michaels and his Photo Artistry and AWAKE programs. I feel like I have finally found my art tribe. One incredible offering available to people in the program ... and to anyone who loves art ... is the magazine: Living the Photo Artistic Life. 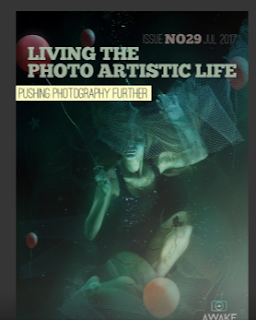 Volume 29 of the magazine has just been released and one of the many stunning images in the magazine is the one above by Nancy Brezendine. My new goal is to someday create an image that is as breathtakingly stunning as Nancy's. Something else I find delightful is how well-represented women artists are in this field and in this magazine. Art shouldn't be gender-biased and in this small corner of the art world, it doesn't seem to be. If you would like to explore this world, click here. It is free and offers an amazing journey through a newer form of art. Loved your blog & agree with you about the great community that we all have found in studying with Sebastian Michaels in his digital artistry courses. 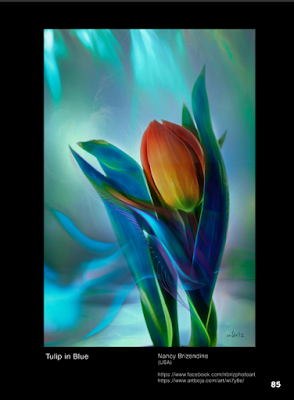 Thank you so much for your kind comments about my tulip picture. Floral photography is one of my passions and I love taking my shots to a more abstract level using their form and color as inspiration. Nancy ... how fun to have you show up at your newest fan's site! I love taking florals, too and I'm going to learn from you.